“Hooray for cow juice!” exclaims self-identified “vampyre,” Octarine Valur, documenting its use in a blog post about blood substitutes. But is it really the same thing? Photo: Octarine Valur/South African Vampyre News. I’ve never really had an appetite for meat and rarely ate it prior to becoming a vegetarian in 2013. I have avoided steak and roast my entire life because I couldn’t stomach the texture of it. Since becoming a vegetarian, I have even become sensitive to the smell and appearance of raw meat. Last summer, I was in the kitchen at a friend’s house and the aroma of the large platter of bloody steaks turned my stomach. The sight of empty styrofoam containers stained with what I thought at the time was blood, was a total turn off. Being part of the Online Vampire Community, a common theme I have noticed is some people brag they get their blood fix from consuming raw meat or rather the blood that comes in the package. The best way to do this is to allow the steak to sit out until reaching room temperature, then cook it on high for about 1 minute per side, the steak should be well cooked on the outside, and red but not raw on the inside, with blood oozing at the mildest touch. This made me want to know, can vampires get blood from raw meat? When you order a rare steak in a restaurant, this explains why you get that bloody looking juice to mop up with your fries. Now what happens to the myoglobin if you cook the meat? When dark meat is cooked, myoglobin’s color changes depending on what the meat’s interior temperature is. Rare beef is cooked to 140° F, and myoglobin’s red color remains unchanged. Above 140° F, myoglobin loses its ability to bind oxygen, and the iron atom at the center of its molecular structure loses an electron. 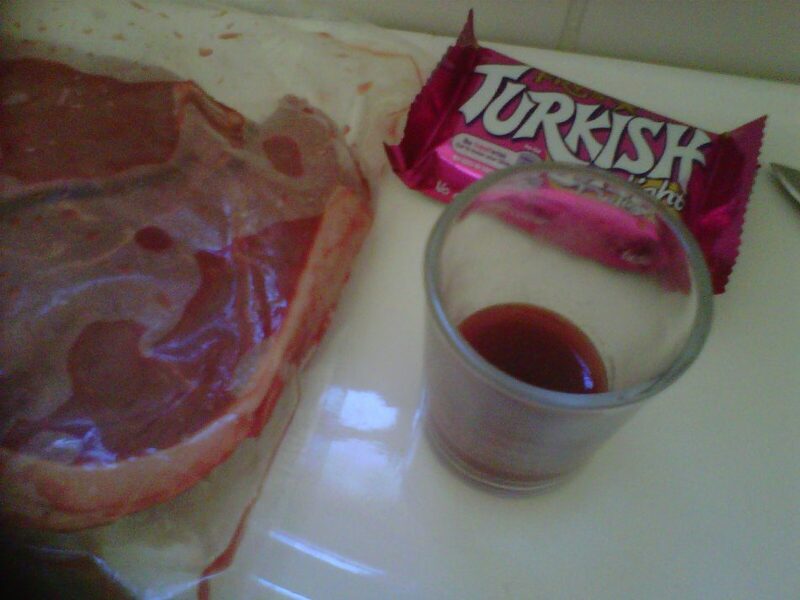 This process forms a tan-colored compound called hemichrome, which gives medium-done meat its color. When the interior of the meat reaches 170° F, hemichrome levels rise, and the myoglobin becomes metmyoglobin, which gives well-done meat its brown-gray shade. Bottom line is vampires need to look further than the prepackaged meat in the grocery store for blood. Plus who can account for the freshness factor? psi angel 7 shared the following experience: Quoted in Johnny “Doc Evil” Titanium, “Smoke and Mirrors,” Something Awful, Dec. 3, 2006, accessed May 23, 2016, http://www.somethingawful.com/weekend-web/smoke-and-mirrors/1/. archive.is link: http://archive.is/Iw2DI. Vamped‘s editor has scrutinized before: Anthony Hogg, “Real Vampires,” The Vampirologist (blog), May 8, 2014, accessed May 23, 2016, https://thevampirologist.wordpress.com/2014/05/08/real-vampires/. archive.is link: http://archive.is/nOidt. blood can be obtained from raw meat: [Steve Leighton], “Getting Blood Made Easy,” www.Vampirewebsite.NET, n.d., accessed May 23, 2016, http://vampirewebsite.net/gettingblood.html. archive.is link: http://archive.is/I6Jjk. if you cook the meat? : Exploratorium, “What Gives Meat Its Color?” The Accidental Scientist: Science of Cooking, n.d., accessed May 17, 2016, https://www.exploratorium.edu/cooking/meat/INT-what-meat-color.html. archive.is link: https://archive.is/JXIvO. “Hooray for cow juice!”: Octarine Valur, “Blood Substitutes – Hooray for Cow Juice! – by Val,” South African Vampyre News, July 30, 2012, accessed May 28, 2016, https://savampyrenews.wordpress.com/2012/07/30/blood-substitutes-hooray-for-cow-juice/. archive.is link: http://archive.is/DtDi7. Silly vampires; steaks are for the living! And they are MOST delicious as a one-inch thick ribeye with a light marinade or spice rubbing and seared to medium-rare. Delicious! Haha Kevin! That raises a good question, if a vampire eats a raw steak do they prefer it plain or with some flavour? This article has alot of merit. Myself I’m a fitness guy so proteins and sodium carbs,etc are always having direct effect now as blackbltfrstdg semi pro/and amateur boxer 50yrs of age.my nutrition is. As important as breath control.Now I eat 7 steaks handcrafted everyweek.heres what I can personally say.Intresting ,thought provoking big college words I’ll never figure out. No insult I am a craftsman and Artiste ..i.e. guy who works with hands.take all suchysuch leave basics and do things without emotion flavor taste sensory is zero to me.Bloid is as intriguing as cali wine is to the latest Asian cab. As is Regional pint and my fave Romania any kind of deux francois. Simple basics regular action gets better heath more nutrient absorbed and killer rock bod.i could care less because I’m simple uneducated.. Yes .Noooo it’s because i can pyhysio feel.what dif types, dgreee,temperature enviro,health,diet of what comes from my choice of wine to dine with is a door and choice.love everything VAMPED.And I am a guy who loves to drink from varied grapes of regions and varied degree of wrath..
Interestingly enough, myoglobin (protein in muscles) & hemoglobin (protein in blood) both serve the same primary purpose, to store & transport oxygen within a body. Just a speculation here… Perhaps it is the protein within the blood that the vampiric human craves. A perhaps the protein within the meat is similar enough to help with those cravings and even help with other negative symptoms vampiric humans have reported to having. Not sure what would create such a biological need for hemoglobin but it is an interesting thought.